"Rabbit stew made with bacon, wine, garlic, shallots, other herbs and spices." Place bacon in a large, deep skillet. Cook over medium high heat until evenly brown. Drain on paper towels and set aside. Sprinkle rabbit with salt and coat with 1/3 cup flour, shaking off excess. Brown rabbit in remaining bacon fat. Remove from skillet, along with all but 2 tablespoons of the fat, and reserve. Saute shallots and garlic in skillet for about 4 minutes, until tender. Stir in wine, 1 cup water and bouillon. Heat to boiling, then stir in jelly, peppercorns, bay leaf, and rosemary. Return rabbit and bacon to skillet. Heat to boiling, then reduce heat to low. Cover and let simmer about 1 1/2 hours or until rabbit is tender. Remove bay leaf and discard. 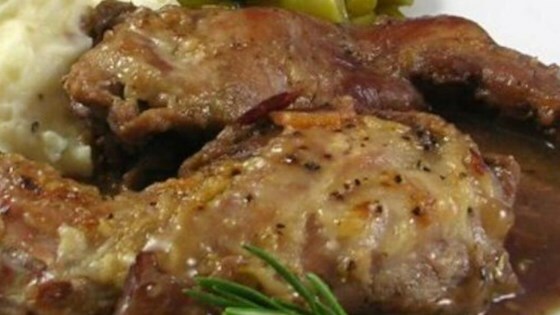 Place rabbit on a warm platter and keep warm while preparing gravy. To Make Gravy: Stir lemon juice into skillet with cooking liquid. Combine 3 tablespoons water with 2 tablespoons flour and mix together; stir mixture into skillet over low heat. Finally, stir in thyme. Pour gravy over stew and serve, or pour into a gravy boat and serve on the side.